At the beginning of July, members of the Conclave of St Martin at Sées gathered in the beautiful market town of Skipton, in North Yorkshire, for their annual lecture. Skipton was chosen as a venue central for the majority of members, and proved to be a good move, with the 16 present travelling from Northumbria, Yorkshire, Lancashire, and Cumbria, from where we were pleased to welcome the Grand Chancellor, R.E. Chevalier Barry Uttley and his wife Dianne. 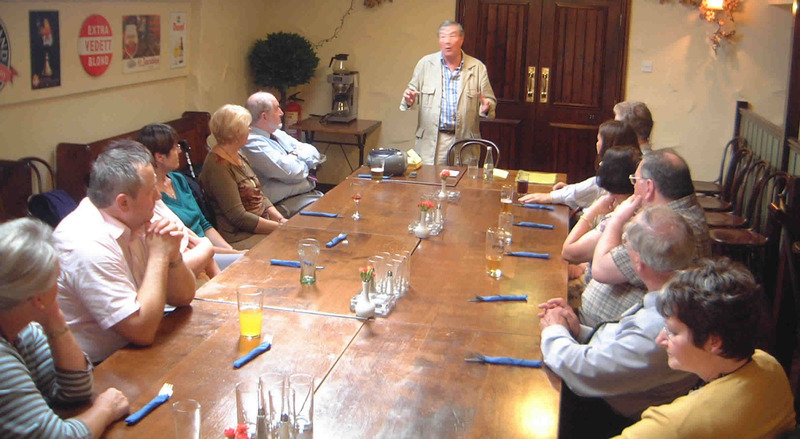 Many of those present took the opportunity to browse the market and historical sites before we all gathered in the function room of a local hostelry, where the Commander, E. Chevalier David Haywood welcomed the informal gathering before introducing the guest speaker, Gordon Hill. Gordon is a self-employed hypnotherapist and psychoanalysist, and his talk explained how these therapies work, and gave examples of the types of habits that could be “cured”. He then gave a practical demonstration of relaxation hypnotherapy. He had spoken earlier of how the client could only be hypnotised if they really wished to be, and it was unfortunate, therefore, that the person who volunteered to be hypnotised did not ‘succumb’. However, three of those watching who chose to close their eyes and go along did actually go into a meditative state! Unfortunately, Gordon was not able to stay after the talk, but he received grateful thanks from those present for such an interesting and informative session. Following the demonstration an enjoyable meal was had, with an excellent opportunity to ‘catch up’ with friends. At the end of the meal, the Commander announced that no charges had been made by either the venue or the speaker, and he had therefore decided that the amount set aside for this would instead be donated to the Grand Master’s chosen charity, Whizz-Kidz, which met with unanimous approval. The Grand Chancellor added his own thanks, and also brought best wishes from the Grand Master.